The below narrative accompanied the formal submitted evaluation of Judge Svaty to the Nation's Repository of Courthouse Information, where he received nearly across the board ratings of "F". The public must be saved from this corrupt judicial monster. This is also being shared with the U.S. Justice Department and the national news media. Without question, nor any reservation, Judge Ron Svaty is woefully corrupt and a menace to society -- He MUST be removed from the bench and disbarred. Although he's been pulling out all the stops through his family's political ties to sweep this matter under the rug, the prima facie evidence of his wrongdoings speak volumes, and he has only made matters worse for himself and the others implicated in the cover-up. 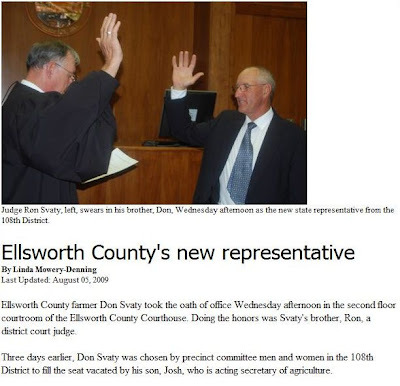 And to get a sense of the incestuous environment Judge Svaty is accustomed to working within see the below picture and article titled "Ellsworth County's New Representative". 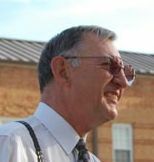 An objective and thorough investigation will likely reveal Judge Svaty regularly accepts bribes in the rendering of his decisions, however to cover his tracks, the currency exchanged is typically bartered favors. I am informed many of his other victims received unspecified threats if they pursued actions or complaints against him. In other words, Judge Svaty is a thoroughly detestable megalomaniac and bully. and be sure to read the reverse chronological account all the way down to the May 26, 2011 entry, along with all the hyperlinks to additional evidence. You will no doubt conclude he is either: (1) a dangerously corrupt and heartless judge with no regard for due process or constitutional rights; or (2) one of the most thoroughly incompetent buffoons to wear a judicial robe. rendered a decision in a court he very well knew had no jurisdictional authority whatsoever. Under no circumstances am I going to let this despicable excuse for a human being split up my family and stop my three now adult sons from knowing their baby brother. Note: Be sure to view ALL hyperlinked video montages of national TV broadcasts on ESPN, CBS and FOX that are contained in the above hyper-link . . . for you will then realize the magnitude and significance of this matter . . . you will also realize beyond all doubt how dangerous Ron Svaty is. It is not a question of "IF" Judge Svaty is extricated from the practice of law . . . it is merely a question of "WHEN". Among others, this is being shared with the Justice Department, national news media outlets and the general public.